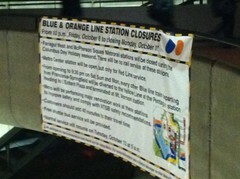 There was the banner this morning reminding me of what I knew deep in the recesses of my mind but filed away: Farragut West, McPherson Square and the Blue/Orange side of Metro Center are closed this weekend for track work. That also includes Columbus Day, Monday October 11th, which Metro considers a holiday, but half of DC workplaces do not. Prepare for abject suffering during this weekend if you need to Metro anywhere. Metro has all the details, including shuttle bus information, and the splitting of Orange and Blue lines, and the re-routing of the Blue line. We’ll have more this week, and a reminder Friday and Monday, about the whole shebang.